7 Nights at 5* Melia Madeira Mare, Funchal, B/B. 5 rounds at: Palheiro Golf x2 & Santo da Serra x3. Airport return and all golf transfers. 1 Dinner at Mare Nostrum Restaurant. Free entrance in Acqua Sensations Zone. 7 Nights at 5* Melia Madeira Mare, Funchal, B/B. 5 rounds at: Palheiro Golf x2 & Santo da Serra x3. Airport return and all golf transfers. 1 Dinner at Mare Nostrum Restaurant. Free entrance in Acqua Sensations Zone. The Portuguese island of Madeira is located in the Atlantic Ocean 540 miles southwest of Lisbon, Portugal, about 360 miles directly west of the African coast of Morocco and 250 miles north of Tenerife in the Canaries. Influenced by the Gulf Stream, Madeira enjoys a surprisingly mild climate, and is a popular year-round holiday resort attracting about a million tourists and holidaymakers every year. Known for its Madeira wine, flowers and stunning landscapes as well as for its annual New Year celebrations that feature the largest fireworks show in the world, the island is also an important stopover point for trans-Atlantic commercial shipping and passenger cruises which regularly call in at Funchal, the main harbour and capital city. With a near-perfect climate all year, dramatic scenery, a wide range of holiday accommodation and a wealth of leisure activities, Madeira can be an excellent choice for golf holidays and breaks in Portugal. There are three top class golf courses to choose from. 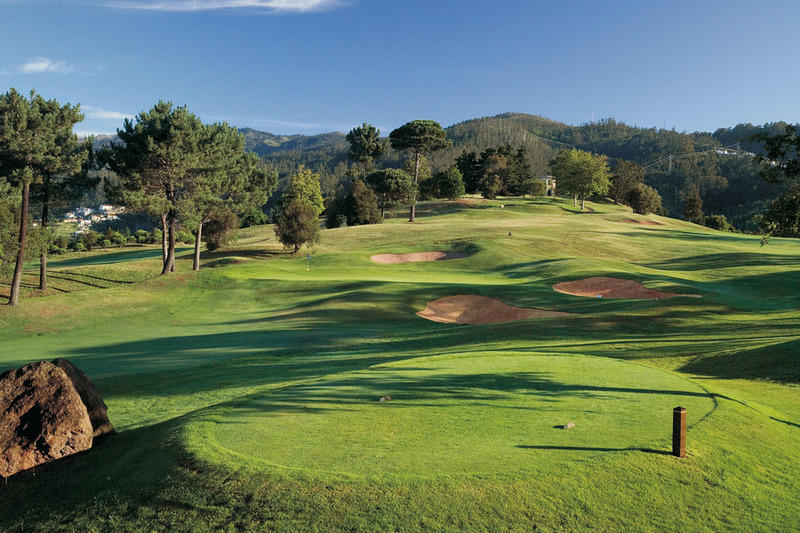 The Santo da Serra Golf Club was built in 1937 and was redesigned by Robert Trent Jones in 1991. The golf course has 27 holes available for play, all characterised by generous fairways, tight undulating greens and a choice of tee positions to suite all abilities. Palheiro Golf with its 18 holes set in outstandingly beautiful surroundings to the east of Funchal offers tight fairways and fast greens; the course is a worthy challenge for all handicap levels. On the neighbouring island of Porto Santo, 40 km from Madeira, there is a spectacular 9 km stretch of golden sandy beach and crystal-clear waters where you can dive after golfing at Porto Santo Golf Course, which was designed by the Spanish golfing champion Seve Ballesteros. The annual Madeira Open is the most important golf tournament in the Madeira Islands and is part of the European PGA thus ensuring that Madeira has the facilities needed to welcome golfers with all handicaps, and from wherever you play, you know you can count on impeccable maintenance and fabulous views. For truly unforgettable golf holidays and breaks in Portugal, the island of Madeira is well worth considering.